ANNOUNCEMENT: The book is FINISHED! Tomorrow morning, my first book is headed off to the printer. "I Was Broke. Now I'm Not!" In just a few weeks, I will have realized one of my life dreams – "To author a book and sell at least one copy!" Anyone want to buy at least one copy? Your opportunity is coming up! Congrats! Are you self-publishing? I am working on a book and would love to hear about your experience/process. 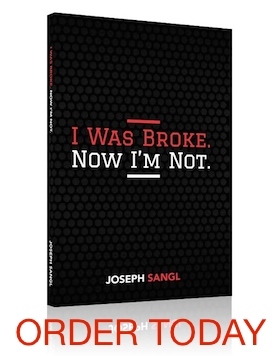 I WOULD DIE FOR A JOE SANGL BOOK!!!! Where do I order a case? Congratulations Joe!! I think you should plan a book signing party where all the folks you have influenced could come and join in the celebration. Keep up the good work! Man!!! I would love to have… I mean buy one!!! Just kidding! Congrats man… Let us know when they are back from print… The Reeder house will for sure buy one!!! Congrats Joe! I’ve been following your blog for a while and you have definitely been an inspiration to me. I will most definitely be buying a copy of your book as soon as it is available. I want to purchase one! Save a copy for the Brown house!